Tina Brooks' star burned with intense brightness before disappearing in the same tragic manner of too many other bop players of the time. Many jazz fans missed Tina Brooks' recordings, the best of which were extraordinary by any measure. A soulful hard bop tenor-saxophonist with a sound of his own, Brooks (1932-74) had a brief life. Most of his better known recordings as a leader and sideman took place during a four year period from 1958-61. Unsung at the time, Brooks is now considered a true giant of the art. Brooks' passionate and full sound and forward-looking style, along with his exceptional compositional gifts, combined to make him a powerful force. True Blue has become one of the most sought-after Blue Notes of all time. True Blue, along with the album Back To The Tracks, contains most of Tina Brooks finest moments on record. Recorded in June of 1960, True Blue showcases Brooks along with the young firebrand trumpeter Freddie Hubbard in a set of highly inventive originals. Driven by an all-star rhythm section, True Blue is exhibit No. 1 for proof of Tina Brooks' majestic sound and soulful writing prowess. 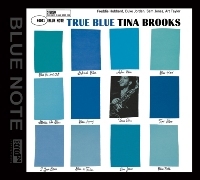 For many aficionados of the Blue Note label, Tina Brooks' True Blue is the very essence of the Blue Note sound and feel. Recorded June 25, 1960. This XRCD24 released in 2009.